Enjoy Experimental Archaeology? Please share! Support Ancient Tools and Craft on Patreon! Last year (2017) this story about the Skrydstrup Woman made the news. Strontium isotope analyses showed that she was not born in the same region where she was buried. Rather than coming from what is now Denmark, she started out life farther south in Bohemia. She was an honoured member of the community, buried in an oak coffin, wearing gold jewellery, and embroidered robes. Her hair was put up in an elaborate style, that would have required assistance. 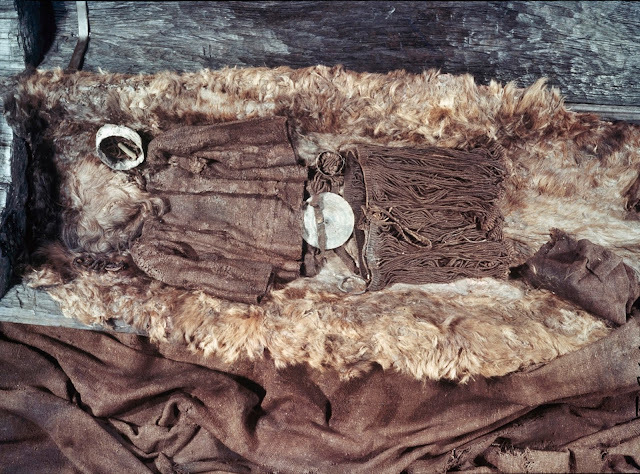 All of those items buried with her would have meant the sacrifice of objects that would have taken many days or even weeks of labour to manufacture. Analyses of her bones indicated she lived a healthy life and died from unknown causes when she was in her late teens. She arrived at Skrydstrup when she was about 14 or 16 years old. New analyses was presented at the 14th Nordic Bronze Age Symposium in Oslo, Norway in June of 2017. The work of the Tales of Bronze Age Women Project (National Museum of Denmark) employed strontium isotope and other analyses to determine the mobility patterns of women in Bronze Age Europe. The early results have determined that the Skrydstrup Woman travelled extensively and that the Egtved Girl did not make one trip from the Black Forest region of Germany where she was born, but made several trips between there and Denmark. The project continues to explore how mobility patterns of prominent women could be a part of social and economic exchange and networking in the Bronze Age. I can relate to these women. By the time I was the age of these young women, I had travelled from where I was born in southern California to San Francisco, from there to the Upper Peninsula of Michigan to Milwaukee and Chicago, over a thousand miles from where I was born. As an adult I’ve lived in both North America and Europe. It used to be assumed that people in prehistory lived their lives in a single community, and if someone travelled long distances, it was assumed to be men. However, then as now, we see that people were mobile. This mobility not only brought an individual woman into a community, but also her way of life. She would have spoken at least one other language, a useful skill if her family were merchants. She might have brought other valued resources to her community, such as a new way of making pottery, new weaving patterns, or other skilled crafts. The objects from her home would have been seen as exotic, foreign, or rare. The history of archaeology has been full of explanations for the movement of people. At times they were described as political conquests or invasions, the Beaker Folk, Anglo Saxons, Vikings… each generation of archaeologists give a new and different interpretation of the data we have. Were they marauding warriors replacing the local population, groups fleeing strife in their homeland, or peaceful settlers arriving with families? Or some of each? The evidence we have of social change in prehistory comes from changes in material culture: a new style of pottery, the introduction of a new technology, or changes in the way the deceased are dealt with. In some cases these cultural changes can be dated and tracked, allowing us to look at the progression of something, such as a craft techniques, from its origins and disbursement. However in tracking all the data on all these objects the humans sometimes get left behind. The bowls, beakers, and axes didn’t move themselves. People were travelling, carrying them, moving from one place to another. It makes sense, humans have been on the move since the beginning. From small bands in Africa, humans have spread out over the entire planet. We continue to move and migrate as groups and individuals to this day, bringing skills, languages, and ideas with us. Creativity, adaptability, and mobility are human strengths. The Skrydstrup Woman puts a personal face on migration. We cannot tell the circumstances that led these women to travel across Europe to Denmark. What remains is that they travelled long distances in their lives, and not just going directly from where they were born to Denmark. Although they have been an icon of Danish prehistory for years, both the Skrydstrup Woman and the Egtved Girl were immigrants. Their story has expanded now, and rather than a symbol of a single national identity, they represent the multicultural world of human prehistory. The video below was produced by the Tales of Bronze Age Women project. It shows the processes used in the analyses of the women and some of the early discoveries of the project. National Museum Denmark, The Egtved Girl. Person, C.P., 2015. A famous Danish Bronze Age icon turns out not to be Danish After All. ScienceNordic. Persson, C.P., 2017. Another female Bronze Age icon is now known to have travelled across Europe. ScienceNordic.